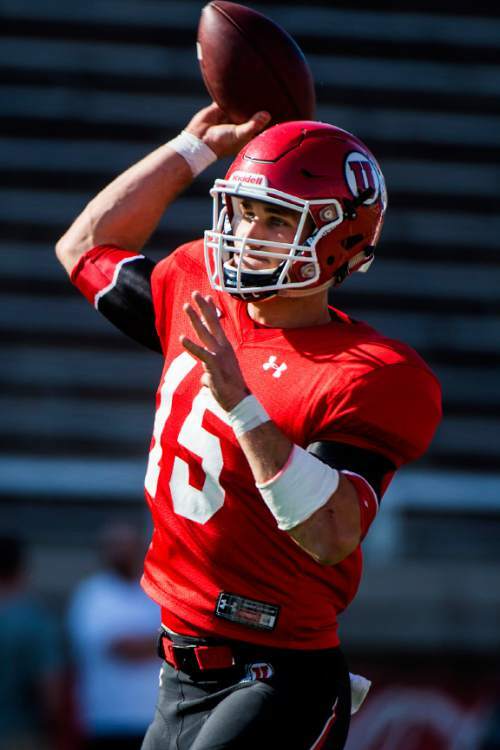 Utah football • He has all the attributes Whittingham wants in a starting quarterback  and he says he's ready to go right now. Al Hartmann | The Salt Lake Tribune Quarterback Chase Hansen looks for a receiver down field during practice Monday August 17. Steve Griffin | The Salt Lake Tribune University of Utah quarterback Chase Hansen throws a pass during first day of fall football camp at the University of Utah baseball field in Salt Lake City, Thursday, August 6, 2015. l Steve Griffin | The Salt Lake Tribune University of Utah quarterback Chase Hansen runs the ball during first day of fall football camp at the University of Utah baseball field in Salt Lake City, Thursday, August 6, 2015. l Chris Detrick | The Salt Lake Tribune Utah Utes quarterback Chase Hansen (15) throws the ball during a practice Tuesday April 21, 2015. Gordon Monson Chris Detrick | The Salt Lake Tribune Utah Utes quarterback Chase Hansen (15) calls out a play during a practice at Rice-Eccles Stadium Friday April 3, 2015. Chris Detrick | The Salt Lake Tribune Utah Utes quarterback Chase Hansen (15) passes the ball during a practice at Rice-Eccles Stadium Friday April 3, 2015. 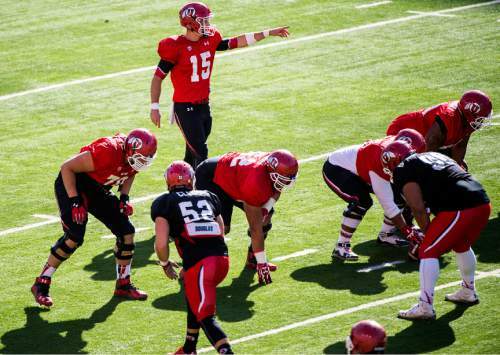 Chris Detrick | The Salt Lake Tribune Utah Utes quarterback Chase Hansen (15) during a practice at Rice-Eccles Stadium Friday April 3, 2015. 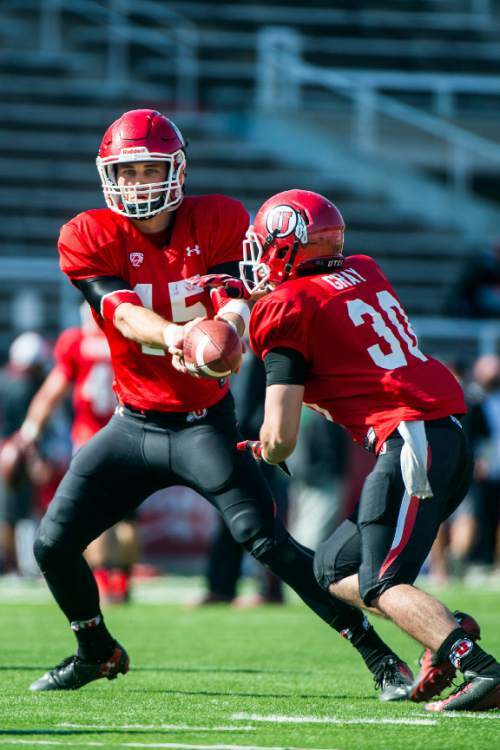 Chris Detrick | The Salt Lake Tribune Utah Utes quarterback Chase Hansen (15) hands off to Utah Utes James Gray (30) during a practice at Rice-Eccles Stadium Friday April 3, 2015. 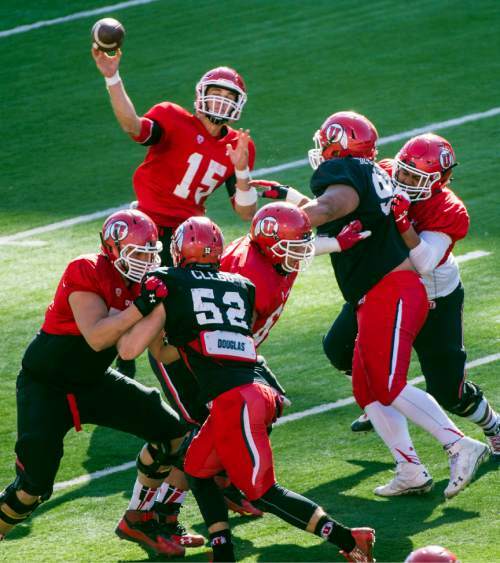 Chris Detrick | The Salt Lake Tribune Utah Utes quarterback Chase Hansen (15) passes the ball during a practice at Rice-Eccles Stadium Friday April 3, 2015. 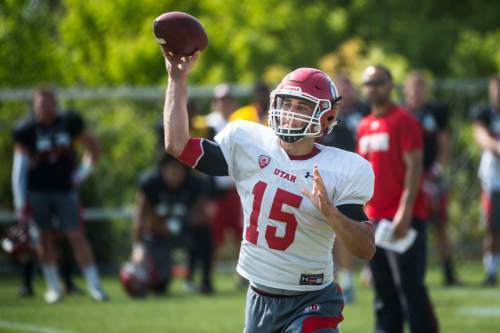 Kyle Whittingham recently was asked what his ideal quarterback would look and be like. He said he wanted a dual-threat guy, a smart, tough, mobile quarterback who made good decisions and created problems for opposing defenses with the run and the pass and who had the leadership qualities to spark his offense. He described a freshman already on his team: Chase Hansen. 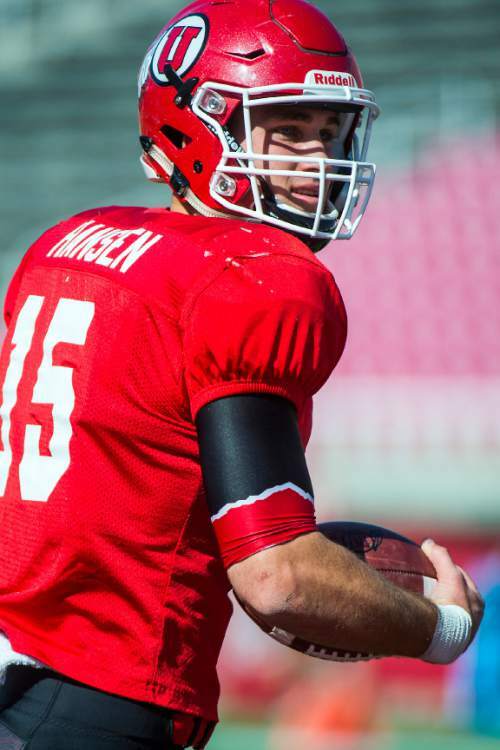 It&apos;s fairly clear to anyone looking in that Hansen is Utah&apos;s quarterback of the future, a designation that satisfies neither co-offensive coordinator Aaron Roderick, nor Hansen himself. 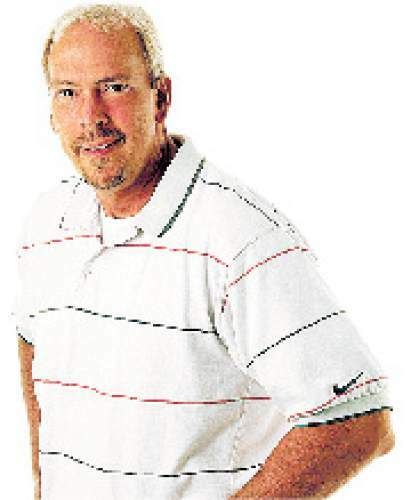 "I would say he does have a great future," Roderick said. "I&apos;m not going to crown him with anything, yet, but he does have a really bright future. He&apos;s got a good arm, he can run like crazy, he&apos;s bright and he&apos;s got leadership. You just see it come out. He&apos;s a fun guy to be around who has a lot of enthusiasm. He&apos;s got a good skill set. It&apos;s just a matter of playing." Hansen has never played in a college game. He hung around the Ute program for a short period after starring at Lone Peak High School and before going on aun LDS Church mission to Australia. He returned in December, and since that time he&apos;s been preparing for what nearly everyone expects to come  a spot as the starting QB for a quarterback-starved program. He expects it, too. The question is … when? 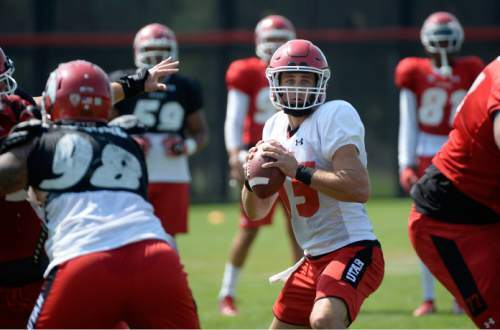 The Utes have two seniors ahead of him  Travis Wilson and Kendal Thompson, each of whom has soared to heights at times and plumbed the depths at others. 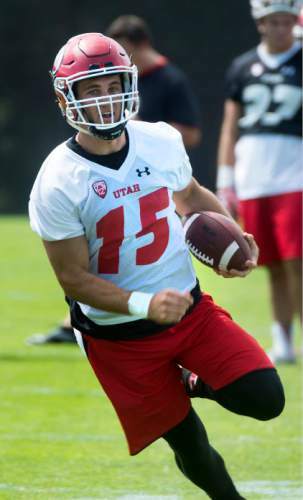 Consistency hasn&apos;t been much of long suit for the Ute QBs. Asked if he thought that future would get launched into turbo-drive this season, Hansen answered: "I hope so. I know I still have a lot to work on and, obviously, that decision isn&apos;t up to me. But the attitude I have is that I&apos;m ready to play. When the time comes, if it comes, I feel like I can perform at this level and I will be ready. It comes down to mentally grasping everything and then going out and using the time to show I am ready." It takes all of about 10 seconds of talking with Hansen to discover he is a compelling mix of eagerness, humility, confidence, and swagger. He knows he has more to learn, more to improve upon. He&apos;s happy, grateful even, to absorb lessons from Wilson and Thompson, but don&apos;t ask him if they are better quarterbacks than he is. Deep in the reaches of his mind, he believes what every quarterback must in order to prosper  that he&apos;s better than every other guy around him. Get a load of the frick (modesty) and the frack (cockiness) of Hansen&apos;s self-evaluation. "The progress is coming," he said. "In fall camp, I have time to learn from my mistakes and to know where I need to improve. Every single day, there is something I&apos;m able to take away, to say, &apos;This is where I need work,&apos; or &apos;This is where I need to improve.&apos; … I do understand the offense; however, I also know there&apos;s a difference between understanding it and applying it so I can make plays." And then he said: "I&apos;m not one to brag, but for me, I&apos;ve always felt that it&apos;s not really a choice. I have to be the best. And whether that&apos;s here at Utah, in the conference, or in the country, I have always set my goals pretty high. My goals are set as high as anyone can set a goal. Now, I&apos;m just hoping that I get the opportunity and that I can make it happen." What is your goal?" he&apos;s asked. "Can&apos;t tell you  yet," he answered. "It&apos;s lofty." Hansen, in an easy manner, talked about his arm being stronger now than it was a few months ago and his legs  he said he&apos;s run a 4.5 40  being a viable threat: "My arm&apos;s as strong as it&apos;s ever been. And my legs feel good. I&apos;ve always been proud of my ability to run, to make plays with my feet. There is a balance. Especially on a team that has Devontae Booker. I really want to develop as a passer. I feel confident in my arm and in my legs, but mostly I&apos;m confident in my mind  making plays from the pocket, running and passing with confidence." Roderick said Hansen has a noticeable presence about him. And, indeed, when he walks on the field, there&apos;s almost a strut that screams: "OK, kids, Daddy&apos;s home." "That&apos;s one of the things I love about playing quarterback," Hansen said. "People look to the quarterback to be that type of guy. On the field, I&apos;m not angry, but … I&apos;m instantly ready to play, to be a football player, to do whatever it takes to win. That&apos;s always been the way I&apos;ve played. When I step on the field, that&apos;s how I feel, especially when the lights are on. I feel very confident out there, but I try to be as humble as possible when I am training and recognize I have a lot of work to do." Wilson, who is a few months younger than Hansen, has played three more college seasons, has observed his stable mate and is impressed, saying: "He&apos;s a great runner, he&apos;s got speed, he&apos;s smart with the football, and he&apos;s quick with his decisions. He&apos;s doing a lot of great things right now. He&apos;s learning a lot from me and Kendal, so I&apos;m trying to teach him. He&apos;s becoming more of a leader and kind of taking over our role." Nobody knows when the takeover will be complete. Some say next season, after Wilson and Thompson are gone, and some say this season, while they&apos;re still here. Whittingham said the other day that the preseason depth chart reads now the same as it ever did: Travis-Kendal-Chase. But here&apos;s one thing to remember: Whittingham loves tough guys, tough quarterbacks, and the 6-foot-3, 216-pound Hansen also played linebacker in high school. "We did a five-year study and it showed that there&apos;s about a 20-percent chance that we&apos;ll make it through the season with one QB," Roderick said. "We looked at the whole country, and that&apos;s just the way it is. You never know what&apos;s going to happen. All the quarterbacks have to be ready. You&apos;re always just a snap away." 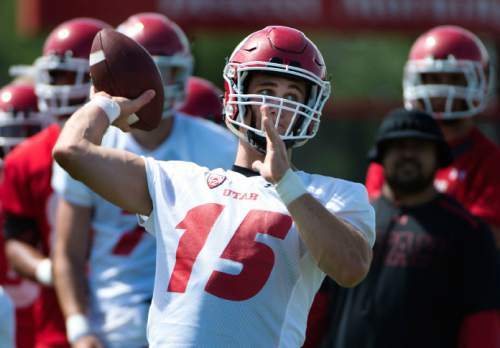 There&apos;s comfort, though, for the Utes, knowing the next QB is in the fold, a dual-threat guy with duality in his attitude  willing to listen and learn, to work to prepare, all the while believing he&apos;s ready, believing he&apos;s already the best, believing he&apos;s the quarterback Utah has needed in the past and needs, like, right now.